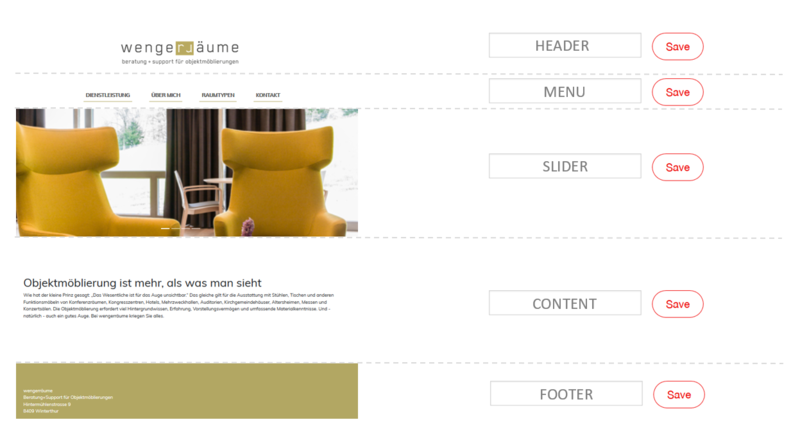 With this tutorial you will create awesome web templates quick and easy. Get access to almost every line of your own template code. Your possibilities are limitless. You can create a new template inside our Online Creator. Create your own account or get acces to an account of one of your clients. Reseller Code: If you create a template on commission by an agency, you will need a reseller code. Please ask your agency before you start. A Resller Code can give you access to locked modules and will unlock them automatically. After a successfull login, you will see the main menu of the Online Creator. Your website is set up with a default template. To edit your templates you will need these marked moduls. The setting module 1 can only be activated with a Basic Account, Pro Account or a Reseller Code. With your Setting module 1 you are able to manage the areas of your website. These areas are used to structure your website and to fill it with content. It is necessary to define them at the beginning to fill them with static content afterwords, like text and images. With the Design module 2 you get access to your current template of your website and all others. Here you can customize the CSS file of your template and add more HTML code to your areas. Tip: Take a look on question marks ? to get useful informations. You will find them mostly near important settings. Areas are placeholders, compareable with HTML elements (such as DIVs). You should define them right at the beginning. They are necessary to structure your website and should be changed rarely after you defined them. To set these areas correctly it will help you to have a HTML segmented structure in mind. Just name these areas after your main areas of your website. Tip: Default areas, such as "Header", "Content" and "Footer", are often predefined. Tip: Specialized areas, which are escaping the normal side structure, should be separated. Tip: Plugins (such as sliders, news or galleries) should get loaded inside areas with the same name. This will help you later. In your settings module 1 you can edit existing areas, add new ones or change the order. "Active" marked areas are getting loaded automatically with your website. You should name especially new areas unique and wisely. Your area names will get saved after a click on the "save" button. In case the checkmark "Editable" 2 is set on a specific area, this area will be also avaiable in your main menu (see picture below) to fill them manually. Such areas are automatically provided with a WYSIWYG editor and are mainly used for editing static content, such as texts or images. An area should only get the status "Editable" if its content will get managed often and manually. For all other areas, the check mark "Editable" should be removed (you can change these settings any time). Only areas marked "Active" 3 will be loaded on your page. Make sure that these check boxes are only enabled for areas you want to load. Regardless of whether the area is editable for the customer or not. Sometimes is better to set an area on "active", but to remove the mark "editable". This will give you and yours clients a better overview afterwards. Tip: For recognition it is better to name the new areas unique and wisely. Tip: Don't forget to set an area on "Active" if you want to load this area on you website. You can manage and edit your templates (in that case similar to a design) by our design module. A template is simply composed by CSS and HTML code, which makes it easy to customize. Note: Creating a backup (backup module required) will also save your current template. Your created backups can be loaded at any time. Be carefull - If you load one of your backups, your current template of the web page will be overwritten with your backuped template. A backup should therefore be loaded carefully. Once you loaded a backup you will find the template of your backup in your template list as well. You can easily edit any of your designs / templates. Simply select one from the drop-down menu and click on "Edit". Afterwards you will see the edit mode of your selected design. Tip: You should only have one template. Delete the others if you dont need them. Tip: By creating a backup, your current template will also be saved. But images and other media content will not be saved. Tip: By loading a backup you will get the template from this backup available in you dropdown list. Tip: Delete those templates from your backups if you dont need them. After selecting a suitable design you should click on "Edit". You will get access to the edit mode. Here you can access the CSS file of your website. Your CSS file will be loaded at the end of all other CSS files. This allows you to override any other CSS properties, which are loaded from another file for example. Tip: Use your browser console to see the linenumbers of your CSS properties. These are similar to the edit console of your CSS file. Note, that your CSS file will be "minified" on an external server. Tip: It is advisable to always write the associated CSS selectors together in one single line, eg. so #footer .icons a. Otherwise they can be problem during the "minified" process. Below the CSS Editor you will find the button "More settings". This opens the structure editing mode of your template. With that you have the possibility to insert further HTML code around your previously defined areas. You can also choose a style library to be loaded with your website. Areas you previously marked as "Active" are now displayed in a dark gray. Areas with a lighter gray, are the inactive ones. They get ignored when loading your website. Just one language is active: src="Homepag/uploads/Images/logo.png"
More then one language are active:  src="../Homepag/uploads/Images/logo.png"
Tip: It is advisable to wrap your areas with a DIV, selectable by an unique ID (ideally with the same name). Afterwards you can select your areas by ID. Tip: You can define additional classes for your main menu, if you scroll right down to the bottom of this page. Here you can add more classes. Plugins can be activated and loaded by our plugin module. Each plugin has its own settings. To activate plugins, just click on the button "More plugins". After you can activate your plugins as you wish. Attention: Certain plugins will charge fees. If you have used a reseller code, you should clarify which subscription has been activated. Only with the Pro subscription, all plugins are free to activate. Your plugins will be listed chronologically. To load plugins automatically on your webpage, they must first be assigned to a page and optionally to an area. Plugins can be assigned to multiple pages 1.1 and multiple sections 1.2 of your web page, even at the same time. You can decide by yourself, where your plugins iwill be loaded. Each plugin has its own settings 2 to manage it. Certain plugins need basic configurations to get loaded correctly. It depends by the plugin. Tip: Basically, plugins can be assigned to several areas, but this is not advisable. Some plugins are not fully compatible with that. Each plugin has its own configuration. Some plugins, such as the news, blog or banner plugin, even have "advanced settings". Such plugins open a small editor in which the HTML code can be entered. This HTML code get reloaded for each element within the plugin (for example, for each blog post). Placeholders can now be used to define where the individual details of an entry have to be loaded. Tip: Be sure to set these settings in any activated language, if you have more than one language enabled.